It’s almost Halloween and there are a TON of fun events around the city. Here’s a list of a few of my favorites. Parking is free! Our treat. North and South Lots available each night. Educational Activity Stations 9 a.m. – 2 p.m.
Cardinal Glennon Kids Interactive 9 a.m. – 2 p.m. Bubble Bus 9 a.m. – 2 p.m. Gypsy Rose Pirate Ship 9 a.m.-1 p.m.
Strolling Entertainment 10 a.m.-2 p.m.
Pumpkin Stomp ‘n Chomp animal enrichment 9:30 a.m. – 2 p.m.
Crafts and Games 9 a.m. – 2 p.m.
Costume Character Meet-and-Greet 1 p.m.- 2:00 p.m. Admission is free from 9 a.m. to 4 p.m. only. October 5 – 6, 11 – 14, 18 – 21, 25 – 28 (Thursday – Sunday) 6:00 p.m. – 10:00 p.m.
Halloween is just around the corner! Enjoy the season with a one-of-a-kind celebration, featuring themed shows, a DJ in the Bauernhof courtyard, and themed Deer Park rides with Halloween lights! Costumes are encouraged and welcome. Enjoy a reserved space for your group during the Grant’s Farm Halloween nights event when you book a party in Cedar Grove. Join us every Saturday and Sunday in October near the Clydesdale Stables. The festival is free for the pumpkin patch area and animal shows. The Kid Activity Zone is $6 per child/day to participate in the activities and free for adults to enter. And don’t miss our Animal Keeper Talks at 11am and 3:15pm. Ride the wagons out to the pumpkin patch to search for your great pumpkin. Our pumpkins range from a couple of pounds to more than 150 pounds so we are sure to have the perfect jack-o-lantern for you! Wagon rides, country music, live entertainment, pony rides, funnel cakes and festival foods make this a fun-filled weekend for everyone! Children’s activities. Petting farm. For more information call Eckert’s as (618) 233-0513. Saturdays and Sundays throughout the entire month of October. Step into the wonder and beauty of butterflies, insects, spiders and their other many-legged friends! Your little bugaboos will be able to play games, create spook-tacular crafts and take home lots of loot after they visit our many hand-painted Treat Houses. Families can dance to Monster Jams at the Bug Ball or spy on the amazing Owl Butterfly, which are only active during dusk and dawn. When tummies rumble, guests will munch on a spook-tacular dinner that will include themed menu items such as creepy pizza fingers, cream cheese, petrifying pastries, eerie pudding, frightful fruit, pumpkin punch, and so much more! Admission into the Butterfly House, activities, light refreshments, crafts, treats, and goody bags are included in the event ticket price. Space is limited and reservations are required. Oct 19th 9:30 a.m. – 8:30 p.m.
Oct. 20 & 21 9:30 a.m. – 5:30 p.m.
Bring the whole family (dogs included) out to Purina Farms for some dog-gone fall fun featuring games, live entertainment, food trucks, music and more! Kids activities include facepainting, storytelling, circus & magic shows, canine performances, a costume paw-rade and more! Be sure to stop by the Family Activity Area (extra fee applies) featuring trick-or-treating, inflatables, giant maze, pumpkin games and balloon animals. Parking is $5 per car or $20 per bus (Note: Parking is free for field trip school buses). RESERVATIONS ONLY!! Walk-ups will not be accepted. Call 314-982-3232 to make a reservation. Plus, this event is dog-friendly, so bring your favorite canine pal with you! We’re handing out candy for the kids and Purina dog treats for the dogs! Toys and snacks will be available for those with food allergies. Enjoy face painting, balloon animals, and a family entertainment area. Plus, the Visitor Center will be open and regular activities will be available, including dog shows, wagon rides and farm animals. Also, dogs will enjoy an obstacle course and sandbox filled with pumpkin tennis balls. Tickets must be pre-purchased online. WALKUPS WILL NOT BE ACCEPTED. Purchase tickets here. Trunk or Treat is offered at at two different times: 11 a.m. and 12:15 p.m. Children ages 2-10 and dogs are $10 each. Will open September 29th. Throughout October the farm is transformed into “PUMPKINLAND” a farm-fun, pumpkin-powered play area. Pumpkinland is open daily throughout the month of October at both the Maryland Heights and North Hanley locations. The farm markets at all three locations are still open 7 days a week. General Admission is available everyday that Pumpkinland is open but is general admission only on weekends. Parties and groups are welcome on Saturdays and Sundays but are not eligible for group rates. Party areas are available free of charge but tables cannot be reserved in advance, it’s a first come, first-served basis. General admission includes access to the whole Pumpkinland play area, petting zoo, corn maze and wagon ride. Concessions, face painting, pumpkin decorating, pony rides and a corn cannon are available on weekends only for an extra charge. Science gets spooky at the Saint Louis Science Center’s annual Science Spooktacular! Bring your young ghouls, goblins, astronauts and dinosaurs to our Halloween celebration and get hands-on with spell-binding science at this family-friendly program. Make your own slimy creation – oobleck! See a live owl demonstration from the World Bird Sanctuary! Watch pumpkins go splat from the highest floor of the Science Center, view the night sky through a telescope, and enjoy Halloween-themed shows in our OMNIMAX® Theater and James S. McDonnell Planetarium! October 27th beginning at 11am kids can trick or treat. They also will have a Halloween Party and Parade October 31st from 5:30 – 7:30. Join us after dark for a hayride around Faust Park. Then wander through candlelit historic homes, where refreshments and story-tellers await. Warm up with a bonfire and live music. All tickets are sold in advance. Call 314-615-8332 or 615-4386. Tickets can also be purchased on our website. Friday Oct. 5 6 p.m. / 7 p.m. / 8 p.m.
Saturday Oct. 6 6 p.m. / 7 p.m. / 8 p.m.
Meet at Mustang Shelter to enjoy Greensfelder Park under the stars. You’ll ride a haywagon through this beautiful afternoon & evening setting. After your hayride, enjoy roasting marshmallows over an open fire, sipping hot chocolate while listening to live country music. Dress for the weather. Space is limited. Advance registration is required. Call 314 615-5572. Saturday Oct 13 4 p.m. / 5 p.m. / 6 p.m. / 7p.m./ 8 p.m.
Fall is in the air with crisp cool nights and crackling bonfires. In store for you is a fun filled evening with Live Music, Bonfires to warm by, Food Trucks & Winery with a variety of good eats and drinks for purchase. Kettle corn popped hot on the spot and continuous hayrides around the park. Parking is in the lot at the New Lemay Pavilion (305 Gregg Rd.) with a short walk to the open cantonment field. Purchase tickets in advance on the web, $10 per person ages 2 and up (everyone must have a ticket for the hayrides.) Sorry no coolers. Dress warm as October can be chilly, a lawn chair is suggested. To register or for more info call 314-615-8822 or 8820. Meet at White-Tail Deer Shelter to enjoy Lone Elk Park like never before. Ride a hay wagon through this beautiful setting and spot Elk, Deer and other wildlife. Later you can warm up by the fire, roast marshmallows and listen to live music. See if you can pick out the sounds of Elk bugling in the distance. Bring a flashlight, lawn chairs are welcome and music starts at 7pm. Space is limited. Advanced registration is required. Call 314 615-8822. Friday 10/19 6:30p.m. / 7:30 p.m. / 8:30 p.m.
Saturday 10/20 6:30p.m. / 7:30 p.m. / 8:30 p.m.
It’s time for Monsters on the Meadows!! Dress up your little ghosts and goblins and come out for all the fun on Saturday, October 27th from 11am – 2pm!! Mark your calendar and save the date for October 27th!! It’s the Meadows annual Halloween Event! We’ll have Trick or Treating, Free Pumpkins, Pumpkin Painting and live Bluegrass Music. Trick or Treating is from store to store and the pumpkins & music will be in/around clock tower plaza. Come enjoy candy, hot chocolate, S’mores and other treats under the Haunted St. Vincent Shelter. There will be best costume prizes, sand volleyball and other fun activities for the entire family. Call 314-615-8788 for more information. Hear spooky stories told by costumed storytellers above the bluffs of the Mississippi at the Barracks. Candlelight and creaking floors in the buildings and wood fires and noises from the woods set the scene for this once-a-year exclusive. Two story times offered. Limited space available. Advance registration is required. Call 314-615-8800 or e-mail jmagurany@stlouisco.com. Time: Sessions at 6:30 p.m. and 8 p.m.
Hey Kids! (And Adults too!!) It’s time for Halloween and time for some pumpkin carving. Join a Park Ranger for a fun afternoon of carving pumpkins in the park. Pumpkins, carving tools and designs will be provided. You can also bring your own favorite design, or just free-hand your carving. Advanced registration required by calling (314) 615-4386. Enjoy this family fun event which includes hayrides and a marshmallow roast around the bonfire. You’ll love our scavenger hunt where the first 10 to finish will win a prize! We’ll have more fun with crafts, pumpkin, a costume contest and our “Haunted Caverns” at the end of the program. Call 314-615-8839. If you would like to share an evening with those that love all things that go “bump” in the night, our story-tellers can customize an unforgettable spooky experience for your group. Reservations are required at least two-weeks in advance. Events can be held at Fort Belle Fontaine, the General Daniel Bissell House or Jefferson Barracks Park. Call (314) 615-8800 or email jmagurany@stlouisco.com for more information or to make your reservation. Families and small groups can join in the fun of a Hayride Hoedown at Broemmelsiek Park! Guests will experience a 45-minute wagon ride through the park, along with a light dinner, s’mores, and the foot-stomping, knee-slapping performance of Babaloo, a one-man musical comedy act suitable for all ages. Pre-registration required. Choose from a 6, 6:45 or 7:30 p.m. haywagon departure. The World’s Largest Halloween party takes place five weekends beginning Friday, September 28th through October 28th. Haunted mazes, Scare Zones, Halloween themed shows, kids’ attractions, zombies, freaks and elaborate decorations transform the theme park into a scream park. This event contaminates kids with the tools needed to make healthy choices around Halloween, while helping to curb candy consumption. Kids can bring their hard-earned, Halloween candy to the event in exchange for chances to win really cool prizes. The event also features live shows, music, face painting, giveaways, snacks and more. All collected candy is sent to the troops through our partnership with the USO. 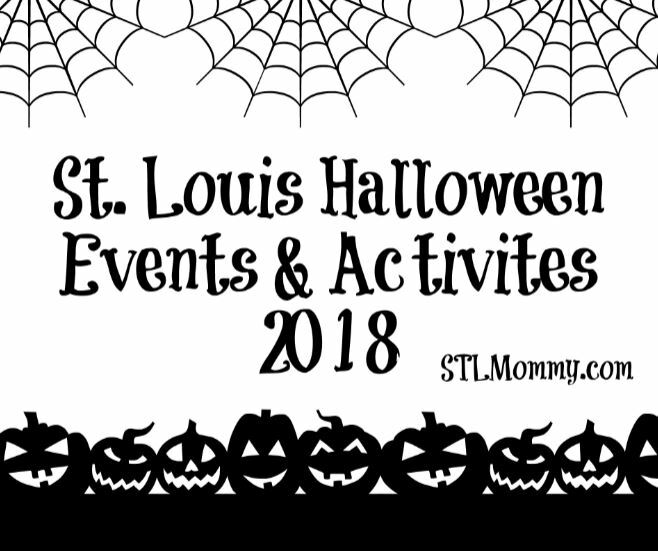 If you know of more fun events please share them below in the comments or on the STL Mommy Facebook page and I will add them to the list!